I have very few new major Bogart movies left to see. There is AFRICAN QUEEN and TO HAVE AND HAVE NOT still on my list, for example. But there are plenty of smaller or lesser known Bogart films still to discover. One such film, until today, was DEAD RECKONING. I watched DEAD RECKONING on 7.17.13. It was my first viewing of the film. This noir concerns a paratrooper named Rip (Bogart) fresh home from the war accompanying his friend Johnny (William Prince). Everything is rosy until Johnny learns that his about to win the congressional medal of honor and all of the attention which comes with it. He freaks out and runs off. Kip chases him to his hometown of Gulf City where he quickly learns that Johnny was implicated in a murder before he went off to war and, more importantly, Johnny got himself dead in a matter of a day or two. 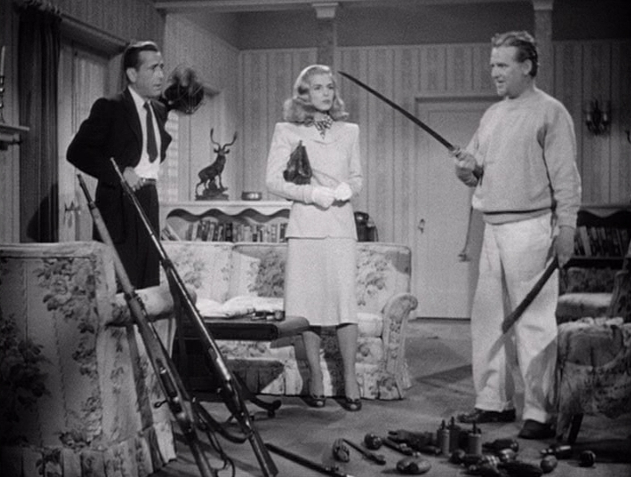 Kip befriends Johnny’s love Dusty (Lizabeth Scott) and goes after local crime boss Martinelli (Morris Carnovsky). Thing escalate quickly. DEAD RECKONING is not bad, but it is certainly derivative. The femme fatale trope is well established by 1947, so this movie doesn’t break new ground there. We get plenty of false starts and possible answers which usually prove to be lies from Dusty, and we see that coming until close to the end. Bogart brushes off some old lines, calling Dusty “kid” and providing a climactic scene which almost exactly mirrors THE MALTESE FALCON. Bogart gets poisoned to the point of passing out, which we’ve seen with Bogie, even if this character is a little more informed in knowing what is about to happen. Despite all that, this movie entertains. Scott proves a great foil for Bogart. She more than olds her own as the deeply voiced and deceptive Dusty. Carnovsky proves a solid villain, even providing some surprising depth of character in his final scene. Bogart is Bogart in full anti-woman form, which is all we want. We even get one great scene with Bogie explaining why he wants to be able to shrink women and keep them in his pocket. It is all very chauvinistic, yet somehow endearing. This is not an all time great film noir. It is textbook both in plot and character. It provides excellent entertainment. It is certainly in the top half of Bogie’s canon and would be higher if it were less derivative. ~ by johnlink00 on July 21, 2013.